1 medium sized beet, roasted. 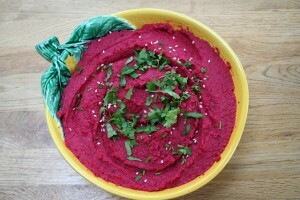 To roast: place beets in a covered dish and bake at 425F for 45-60 mins or until soft. Let cool, then peel and chop into quarter inch pieces. With a blender or food processor, whirl all ingredients until a smooth paste is formed. Adjust salt to taste. Serve with chopped veggies or eat by the spoonful!